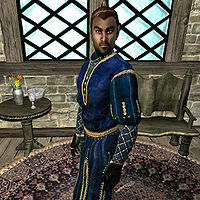 Lord Drad is a Dunmer noble who lives with his wife on the estate he owns north of Anvil. It seems that Lord Drad is not opposed to using slave labor (namely ogre slave labor) to line his pockets, especially in Bleak Mine, which he also owns. The Daedric Prince Malacath, however, does not look kindly upon this particular endeavor. While the ogre slaves work under the watchful eyes of his employees, Lord Drad lives a relaxing upper-class lifestyle and never even leaves the house; after waking up at 8am he picks a random book from the collection near the bed, then studies it until his lunch at noon. The rest of the day, until his bedtime at 10pm, is spent wandering the ground floor, interrupted only by a two-hour dinner at 6pm. After Malacath's quest, Lord Drad and his wife will be punished severely by the now-freed ogres and will be forced to work the land outside the house 24 hours a day, without ever eating or sleeping. He wears a set of clothing worthy of being a Lord. He wears a blue velvet outfit with a piece of jewelry, a copper ruby ring, and a pair of blue suede shoes. He carries a spare of red velvet garment, a hoe, and a large amount of gold. If you have freed all the ogres his upper class clothing will be replaced by a set of lower class clothing: a sack cloth shirt, sack cloth pants, and a pair of sack cloth sandals. Before the quest, Drad is polite and welcoming as long as you steer clear of the topic of slavery. The first time you greet him, he will respond with "I welcome you to my humble home, stranger. What brings you to this place?" If you ask him about his estates, he will tell you that "The land is good, the farm productive." and then either "But it's mining the wealth from beneath the land that will make my fortune." or "The mine's under construction, but once it's working, it will make my fortune. ", depending on how far through Malacath's quest you are. If you ask him about his slaves, he responds with a question: "Can you think of a better use for the mindless beasts? Under my eye, they do some good in this world." If you tell him that "No creature should be a slave. ", he grows angry and tells you "I don't believe I asked for your opinion on this matter. I am done speaking with you. Please leave my estate." The other choice is to reply "I admire your efforts. ", in which case he will tell you "I am quite pleased with the ogre slaves in my Bleak Mine. No issues of slavery with brute beasts. Profitable. And legal." and then you can ask about Bleak Mine: "The source of my income, of course. I bought it for a song from a foolish Orc. My ogres mine the gold, and I reap the reward." Once the quest is complete, Drad will only say "Please! I've got to get to work. If I don't... who knows what those ogres will do to me!" If all the ogres are dead, he will instead say "Please! I've got to get to work! All we have left is the farm!". This page was last modified on 12 June 2013, at 03:10.